Hagger et al. (2016). Implementation intention and planning interventions in Health Psychology: Recommendations from the Synergy Expert Group for research and practice. Psychology & Health, 31, 7. This expert meeting was facilitated by James Pennebaker (USA) & Bernard Rimé (Belgium). This expert meeting was facilitated by Susan Michie (UK), Pascal Sheeran (UK), and Alexander Rothman (USA). This expert meeting was facilitated by Michael Diefenbach (US), Jeanne Edman (US) & Alison Karasz (US). The SYNERGY annual workshop is organised to provide an opportunity for discussion between health psychologists conducting research in core fields within health psychology. The focus is on advancing the standard of work within the field by pooling expertise, sharing critical evaluations, and stimulating networking and collaborative research between researchers from all over Europe in an informal and supportive atmosphere. It is also an opportunity for researchers to present their research for discussion in depth with other experts working in the same field in a friendly and relaxed atmosphere. The workshop will last three days and the scheduled timetable is: Sunday 20th September 1400-1730, Monday 21st September 0930-1730 and Tuesday 22nd 0930-1730. The workshop will be facilitated by: Prof Rona Moss-Morris, University of Southampton, UK; Prof Trudie Chalder, Institute of Psychiatry and King’s College London, UK; Dr Alison Wearden, University of Manchester, UK; Prof Gijs Bleijenberg, University Nijmegen, Netherlands. The facilitators will guide the work, support and moderate the discussion. The workshop fee is EUR 255 (this includes the workshop materials, lunch for Monday 21st and Tuesday 22nd Sept, coffee breaks and the workshop dinner). Please note that accommodation is not included. Rooms have been reserved at the Hotel Granduca (approx. 85EUR pn; see http://www.hotelgranduca.it). Also a few rooms are available at the Campus (approx. 35 EUR pn) for students and/or low economy citizens. Further details about accommodation will be sent separately to all delegates once their registration is received. 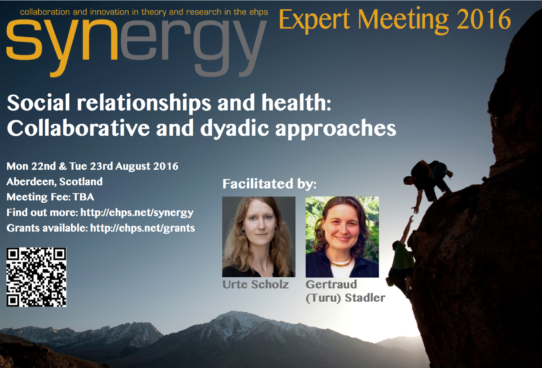 Note that the EHPS is offering 2 grants to those who want to attend the SYNERGY workshop but do not have sufficient financial resources. Each grant will be up to EUR 1100. For further information about the grants, please check the EHPS webite (http://ehps.net) and under EHPS Grants and Stipends 2009. The workshop will be held at the National Research Area, San Cataldo, Via Moruzzi 1, 56124, Pisa (see http://www.area.pi.cnr.it). Participants need to become a member of the EHPS and therefore will also receive the benefits of EHPS membership (www.ehps.net). What: This interactive workshop will promote ways in which researchers can expand the range of methods used for qualitative research. It will also promote the use of innovative methods for designing qualitative research projects, for approaching data collection and analysis, and reporting research findings. Who: The workshop will be facilitated by Kerry Chamberlain. When: Sunday 29th to Tuesday 31st August, 2010. Where: Babes-Bolyai University, Cluj-Napoca, Romania. Accomodation: For accommodation possibilities, please check the EHPS website (http://ehps.net). We recommend Hotel City Plaza and the Retro Youth and Transylvania hostels (all 5-10 minutes from the university; see http://synergyworkshop.eu/accomodation for more information). Food: Lunch and dinner will be provided on Monday; lunch will be provided on Tuesday; and refreshments will be provided during the breaks throughout the workshop. A welcome reception with drinks and snacks will be held on Sunday evening. How much: The workshop fee is €200. Reduced fee: Participants from eligible countries listed on the EHPS registration website are entitled to a reduced fee of €100. Please note that all participants from non-eligible countries will have to pay the full fee regardless of their status. Deadline for application: July 1st, 2010. Notification of acceptance: July 8th, 2010. Deadline for payment: August 1st, 2010. Workshop grants: Two grants are available for attendants of the Synergy workshop, each comprising a maximum of €1100 toward workshop registration, conference fee, accommodation and travel. See the grants page for more information. Qualitative research methodologies are becoming relatively common within health psychology, although their newness promotes a tendency for these methodologies and methods to be used in rather formulaic ways. This workshop challenges the formulaic use of methodology, promotes the use of more inventive and imaginative forms of qualitative research practice, and promotes innovation in planning and reporting qualitative research. The focus is on extending the boundaries and advancing the standard of work within the field. We will consider a wide range of recent developments in methodology – visual methods including photo-voice, photo-elicitation and graphic elicitation techniques, mobile research involving walking and go-along interviews, longitudinal research and multiple contacts, observational methods, drama and arts-based research practices, the involvement of time, space and materiality, as well as the use of multiple methodologies. The workshop will also consider the implications of these research approaches and methods for ethical practice and reflexivity, and examine innovative ways of reporting qualitative research. This workshop is suitable for researchers who have some experience in qualitative health research, and who are seeking to stretch and extend their knowledge of qualitative research in innovative directions. It is not necessary to have extensive experience in conducting qualitative research to attend, but the workshop is not intended as an entry-level course on qualitative research. The workshop will be run as a collaborative engagement, seeking to pool expertise, share ideas and critical evaluations, and stimulate networking. It will involve presentations by the facilitator on key issues – methods, data collection, data analysis, ethics, reflexivity, and reporting research – but a significant amount of time will be spent working in small groups to develop specific research projects brought by participants. Participants will collaboratively help to develop and critique one another’s projects, and each participant will have developed the completed draft of an innovative research proposal at the conclusion of the workshop. Day 1: will commence with introductions and an orientation to the workshop, an overview of the approaches we will take to qualitative researching, a presentation and discussion on recent innovative developments in qualitative methods, followed by presentations of participant’s project topics and ideas. Day 2: the morning will commence with a presentation on data collection and management focusing on non-textual data; the remainder of the morning will involve small group work involving the development of participant projects and reporting back; the afternoon will start with another presentation and discussion about data analysis and reflexivity in research; this will be followed by further group work to refine and justify the methods to be used in research projects. Day 3: the morning will commence with a presentation on challenges for research ethics and creative presentation of research findings, arising from the use of innovative methods; the balance of the morning will be small group work focusing on finalising the research projects, including ethics, data analyses and reporting; the afternoon will be spent on presenting and critiquing the projects. The workshop will close with a discussion to finalise how we report back into the conference. Please develop and bring a research topic, issue or proposal that you are currently planning, or one you are interested to develop, so that it can be worked up and developed collectively during the workshop. Participants will work collaboratively on these projects during the workshop with a view to developing them into finished research proposals. Search out and determine the basic idea for your research topic, issue or proposal. Read some of the articles on the reading list, especially those that appear relevant for your project or those that particularly take your attention. Note that there is now a very wide range of published articles and books relevant to the topics of the workshop. Those suggested on the reading list involve only journal articles and not books, and are just a (somewhat esoteric) selection from the much more extensive reading list that will be issued during the workshop. Feel free to locate other readings of relevance and to bring references to the workshop so we can build up a wider reading list to share. 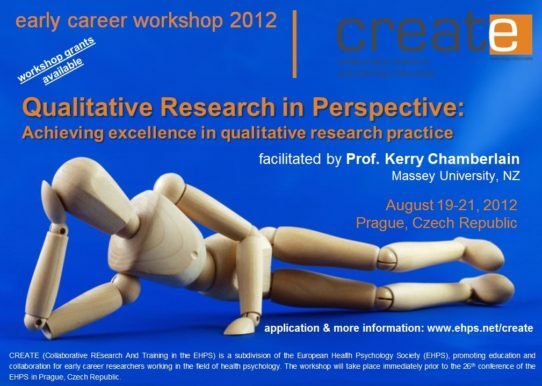 facilitate networks and collaboration between qualitative health psychology researchers in Europe. Finally, we will plan an innovative presentation showcasing the work developed from the workshop for the conference. There are various possibilities for this, so we will plan this collaboratively during the last phases of the workshop. Bagnoli, A. (2009). Beyond the standard interview: The use of graphic elicitation and arts-based methods. Qualitative Research, 9, 547-570. Camic, P. M. (2008). Playing in the mud: Health psychology, the arts and creative approaches to health care. Journal of Health Psychology, 13, 287-298. Carpiano, R. M. (2008). Come take a walk with me: The “Go-Along” interview as a novel method for studying the implications of place for health and well-being. Health & Place, 15, 263-272. Crilly, N., Blackwell, A., & Clarkson, P. (2006). Graphic elicitation: Using research diagrams as interview stimuli. Qualitative Research, 6, 341-366. Catalani, C., & Minkler, M. (2009). Photovoice: A review of the literature in health and public health. Health Education & Behavior, 37, 424-451. Clark, A., Prosser, J., & Wiles, R. (2010). Ethical issues in image-based research. Arts & Health, 2, 81-93. Hawkes, G., Houghton, J. & Rowe, G. (2009). Risk and worry in everyday life: Comparing diaries and interviews as tools in risk perception research. Health, Risk & Society, 11, 209-230. Keats, P. (2009). Multiple text analysis in narrative research: Visual, written, and spoken stories of experience. Qualitative Research, 9, 181-195. Keightley, E. (2010). Remembering research: Memory and methodology in the social sciences. International Journal of Social Research Methodology, 13, 55-70. Mannay, D. (2010). Making the familiar strange: Can visual research methods render the familiar setting more perceptible? Qualitative Research, 10, 91-111. Monrouxe, L. V. (2009). Solicited audio diaries in longitudinal narrative research: A view from inside. Qualitative Research, 9, 81-103. Murray, M., & Gray, R. (2008). Health psychology and the arts: A conversation. Journal of Health Psychology, 13, 147-153. Pink, S. (2008). Mobilising visual ethnography: Making routes, making place and making images [27 paragraphs]. Forum Qualitative Sozialforschung / Forum: Qualitative Social Research, 9(3), Art. 36, http://nbn-resolving.de/urn:nbn:de:0114-fqs0803362. Thomson, R., & Holland, J. (2005). ‘Thanks for the memory’: Memory books as a methodological resource in biographical research. Qualitative Research, 5, 201-219. Rossiter, K., Kontos, P., Colantonio, A., Gilbert, J., Gray, J., & Keightley, M. (In press). Staging data: Theatre as a tool for analysis and knowledge transfer in health research. Social Science & Medicine [Available through online first]. What: This interactive workshop will allow a venue for participants to exchange experiences with N-of-1 design and learn from each other. Who: The workshop will be facilitated by Marie Johnston, Derek Johnston and Diane Dixon. When: Sunday 18th to Tuesday 20st September, 2011. Accomodation: For accommodation possibilities, please check the conference website (http://www.ehps2011.com). Food: Lunch will be provided on Sunday and Monday, and dinner on Monday only. A welcome reception will be held on Sunday evening. Refreshments will be provided during the breaks throughout the workshop. How much: The workshop fee is €225. Reduced fee: Participants from eligible countries listed on the EHPS registration website are entitled to a reduced fee of €112. Please note that all participants from non-eligible countries will have to pay the full fee regardless of their status. Deadline for application: May 20st, 2011. Notification of acceptance: May 27th, 2011. Deadline for payment: July 1st, 2011. Workshop grants: Two grants are available for attendants of the Synergy workshop against workshop registration, conference fee, accommodation and travel. See the grant page for further details. Many theories in health psychology attempt to explain changing aspects of individuals’ behaviour and most interventions attempt to change the behaviour of individuals. So, for example, theories suggests that people’s intentions to act are determined by their current beliefs or that levels of stress are determined by their current appraisal of the environment and interventions may seek to alter these beliefs or appraisals. However theories are mostly tested in between individual studies and it can be shown that theories that apparently apply across individuals do not apply within an individual, as they should. Likewise interventions are mostly tested in randomised trials involving many participants and the applicability of the intervention to the individual participant is difficult to determine. Theory: Discussion of current theories and their use in explaining within and between person variation. The application of psychological theory to the behaviour of the individual. The workshop facilitators work in the areas of social cognition, disability and stress theory but will also draw on the expertise of the participants in other areas. Intervention: N-of-1 intervention designs will be discussed, and theoretical and practical issues of such interventions presented. Methods: The methods of studying the individual over time. We will emphasise the use of electronic based data capture methods such as PDAs and smartphones. Discussion of feasibility and acceptability. Statistical analysis: Analysing time series data. The issues raised by n-of-1 data and current methods of analysis will be presented and explored in practical work. We will also discuss methods of analysing the differences between individuals over time in group based studies using multilevel modelling. Researchers interested in using theory and in developing methods of application and analysis at the individual level. Researchers familiar with single case methods and interested in using these methods to test theory and evaluate interventions. In this workshop we hope to attract health psychologists working both in theory and/or practice since the issues bear directly on both areas. The workshop will be very interactive with at least 50% of all sessions involving active participation in practical or group work and discussion. Participants will be encouraged to bring their own research questions and methodological issues for discussion at the workshop. In addition all participants will be invited to collect data on themselves for a 8 weeks prior to the workshop to gain insight into the problems of such data collection and the data will be used to demonstrate methods of analysis at the workshop. We will use internet based methods of data collection for this. The data will not be intrusive and will relate to Karasek’s demand control theory of work stress since it is probably applicable to all participants. The workshop facilitators are all experienced in n-of-1 studies and in running workshops. Marie Johnston works integrating biomedical and behavioural theories of disability and has both run and attended previous Synergy workshops. Derek Johnston conducts n-of-1 and related studies of occupational stress using EMA and psychophysiological methods, analysing data using time series and multilevel modelling. Diane Dixon runs theory-based n-of-1 intervention studies to enhance physical activity. They have experience of running workshops together. There have been debates for decades about whether we should use mixed methods, that is, qualitative and quantitative methods; those against often cite ‘irreconcilable epistemological differences’ and those in favour promote a ‘toolkit’ approach to choosing methods according to research question rather than theoretical underpinnings. Health Psychology research is primed for mixed methods because of the need to understand things at both the individual and the population level for it to be considered valid evidence that might be used to inform policy and practice. This interactive workshop will bring together researchers with contrasting expertise to discuss the theoretical and practical elements of using both quantitative and qualitative methods in Health Psychology research. We will draw on Pragmatism’s functional definition of knowledge to overcome our epistemological differences and using innovative techniques (including conceptual encounter and dialogal research) we will work through theoretical and practical barriers to collaboratively create a working definition or ‘rough guide’ of mixed methodology in health psychology. 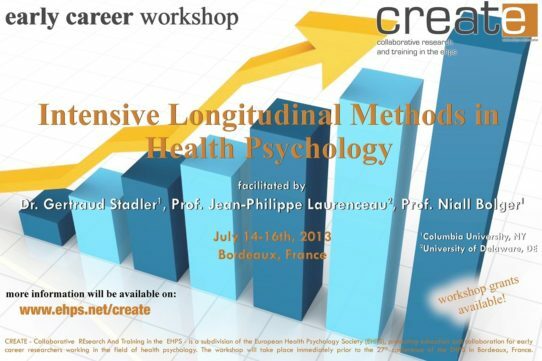 This workshop is key to the future of Health Psychology because of the readiness with which Health Psychology have welcomed qualitative methods, but also because Health Psychologists are often at the forefront of the development of innovative ways of conducting research within mixed discipline studies and applied settings. Health Psychology has a strong commitment to theory and rigour and so it makes perfect sense to ask Health Psychologists with expertise in these so-called opposing traditions to think openly and strategically about how we might successfully bridge the gap between epistemologies and move on to create the knowledge that will inform health care research and practice in the future. This will be a brief introduction to the workshop topic and dilemmas faced by contemporary health psychology researchers – presented by facilitators. A number of issues & dilemmas will be raised and small groups/individuals will be asked to reflect on these at the beginning, across the course of the workshop and at the end and will be asked to bring their reflections to the group at the end. Facilitators will first introduce and present working definitions for epistemology, methodology, method, theory/theoretical model, quantitative and qualitative research. Contributors will then be asked to tell their story, i.e. where their ‘allegiance’ lies in terms of epistemology and quantitative v qualitative methods, theoretical models such as Theory of Planned Behaviour or Illness Representations, and their preferred methodology such as phenomenology, narrative or discursive psychology, action research. They will then be asked to define the guiding principles/central assumptions of each approach and they will be paired up with someone with a contrasting viewpoint. During this activity we will use the conceptual encounter technique (De Rivera, 2006) which facilitates the ‘meeting of minds’ between people with opposed positions. A number of questions will be given to facilitate this process. We will use these conceptual encounters to conduct a mapping exercise (not dissimilar from framework analysis) to determine where there may be overlap in terms of rationale, objectives, outcomes of research, impact on policy/practice of their particular approach to research. Common barriers to mixing methods are ‘irreconcilable epistemological differences’. However, Pragmatism offers a different way of conceptualizing epistemology and our definitions of knowledge. The facilitators will give a short introduction to Pragmatism and its utility for mixing methods in health psychology (Yardley & Bishop, 2008). Contributors will then be asked to engage in activities based on the principles of dialogical research (Rowe & Leifer, 2006). In brief, this method enables a group of participants to work together in dialogue to construct a definition of ‘mixed methods methodology’ in health psychology. Results of all previous exercises during the workshop will be used to inform this process. Contributors will then be asked to present their group definition and the Synergy team as a whole will collate these definitions to create the living document to be used to disseminate the results of Synergy. Results of Synergy will be disseminated in a living document. This document will include discussions about epistemology, theory, methodology, methods of data collection and analysis. A key component of this document will take the form of proposals for synthesizing findings from different components of the work. Yardley & Bishop (2008) propose a composite analysis, where different components of a study become a coherent whole rather than a disjointed set of discrete projects using different methods. 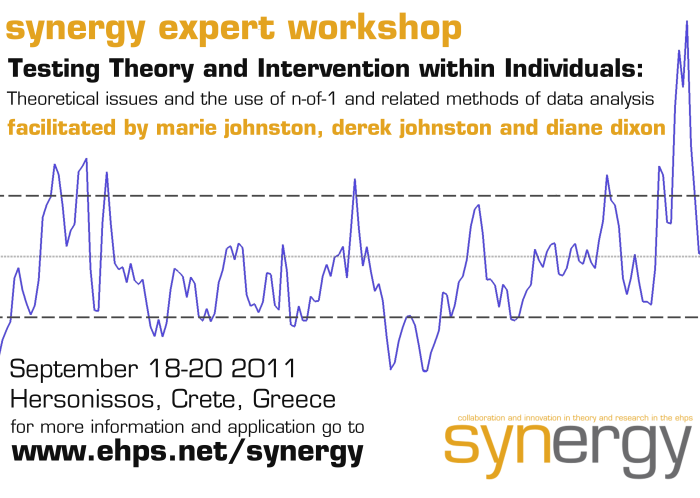 This will be the final challenge of the Synergy contributors – to use their working definitions of mixed methods methodology and all they have learned through the course of the workshop to make proposals for how to achieve a composite analysis. We don’t expect an answer to this question but will aim to create a firm ground on which such proposals can be developed moving forward. Yardley, L. & Bishop, F. (2008). Mixing qualitative and quantitative methods: a Pragmatic approach. In C. Willig & W. Stainton-Rogers (Eds.) The SAGE Handbook of Qualitative Research in Psychology. London: Sage. Dures, E., Rumsey, N. & Morris, M. (2010). Mixed methods in Health Psychology: theoretical and practical considerations of the Third Paradigm. Journal of Health Psychology, 16(2), 332-341. Examples of mixed methods health psychology research from journal articles, tenders, successful bids. More information on the main facilitator, Rachel Shaw, can be retrieved from http://www1.aston.ac.uk/lhs/staff/az-index/shawrl/. In planning health promotion interventions, theories from the behavioral sciences are applied to, first, understand behavior and, second, change behavior. Such interventions apply theoretical methods for change, directed at the target population or at the environment. A theoretical method, or behavior change technique, is a general technique or process for influencing changes in the determinants of behavior of the target population or of behavior of the environmental decision maker (Bartholomew, et al., 2011; Abraham & Michie, 2008). Practical applications are specific techniques for practical use of theoretical methods in ways that fit the intervention population and the context in which the intervention will be conducted (Bartholomew, et al., 2011). There is an increasing interest in systematic descriptions or taxonomies of health promotion interventions, the theoretical methods they contain, and the determinants that are targeted for change (Stavri & Michie, 2012). However, most of these taxonomies focus on individual behavior change and only a few also include behavior change of environmental agents (Bartholomew, et al., 2011; Khan et al., 2009) at the interpersonal, organizational, community and policy levels. Moreover, translating methods into applications demands a sufficient understanding of the theory behind the method, especially the theoretical parameters under which the theoretical process is effective or not (Schaalma & Kok, 2009). Environmental conditions are not likely to be under the direct control of the individuals at risk for the health problem. They are controlled by decision makers at different environmental levels, external agents such as peers, teachers, managers, and other gatekeepers (Kok et al., 2008). To select methods for environmental conditions, the first thing to do is to find out who may be in a position to make the expected change. The planner has to identify the desired behaviors for the agent who will actually change the environmental condition. The health promoter then applies methods for influencing the determinants of the agent’s behavior using methods which are appropriate for changing determinants at environmental levels. The focus of this Synergy workshop is on methods for environmental change. All participants will be asked in advance to bring in their research and practice experiences, discussion topics, and successes and failures with trying to change environmental conditions for health. Every half day in the workshop includes an introduction in the theme, a brief theoretical background, followed by contributions from participants: empirical research examples, practical experiences, theoretical ideas and discussion. At the end of the workshop, a brief summary of the state of the art and the most promising venues for future research will be produced. Planning the implementation of health promotion interventions as an organizational change challenge; planning effect evaluation of environmental change. More information on the facilitators can be found at their websites (Gerjo Kok and Rob Ruiter) and at Google Scholar Citations (Gerjo Kok and Rob Ruiter). Note that at this moment, the price is not yet known. We can guarantee however, that the price will not exceed € 250,-. We will update the price here as soon as possible, and will of course mail everybody who has already applied at that point. Note that participants from those countries listed under the categories low-income economies, lower-middle-income economies and upper-middle-income economies by the World Bank are qualified for reduced fees, which are half the regular fee. A list of these countries is available here. A small number of grants are available for attendants of the Synergy workshop against workshop registration, conference fee, accommodation and travel. See the grants page for further details. Abraham, C., & Michie, S. (2008). A taxonomy of behavior change techniques used in interventions. Health Psychology, 27, 379–387. Bartholomew, L. K., Parcel, G. S., Kok, G., Gottlieb, N. H., & Fernandez, M. E. (2011). Planning Health Promotion Programs. San Francisco, CA: Jossey-Bass. Khan, L. K., Sobush, K., Keener, D., Goodman, K., Lowry, A., Kakietek, J., et al. (2009). Recommended community strategies and measurements to prevent obesity in the United States. Morbidity and Mortality Weekly Report, 58(RR07), 1–26. Kok, G., Gottlieb, N. H., Commers, M., & Smerecnik, C. (2008). The ecological approach in health promotion programs: A decade later. American Journal of Health Promotion, 22, 437–442. Schaalma, H. & Kok, G., 2009. Decoding health education interventions: The times are a-changin’ . Psychology & Health, 24, 5-9. Stavri, Z. & Michie, S. (2012). Classification systems in behavioural science: current systems and lessons from the natural, medical and social sciences. Health Psychology Review, 6, 113-140. There has been a rapid increase in the use of planning techniques in interventions to promote health-related behaviour (Abraham, Kok, Schaalma, & Luszczynska, 2011). The proliferation of interventions using planning has largely been a direct response to the considerable literature which has recognised the limitations of intentions as a predictor of behaviour (Dekker, 2008; Sheeran, 2002; Webb & Sheeran, 2006), the so-called intention-behaviour ‘gap’. Recent theoretical models incorporating both motivational and volitional phases have sought to resolve this issue by examining the role that furnishing intentions with planning exercises plays in improving the link between intentions and behaviour (Gollwitzer & Sheeran, 2006; Schwarzer, 2001; Sheeran, Milne, Webb, & Gollwitzer, 2005). Prominent among these planning interventions are implementation intention and action planning techniques. These techniques aim to bolster or augment intentions with means to promote recall and enactment of the intended behaviour. These planning techniques are two of the most recognised and frequently-applied components in health behaviour interventions (Adriaanse, Vinkers, De Ridder, Hox, & De Wit, 2011; Bélanger-Gravel, Godin, & Amireault, 2013; Webb, Sniehotta, & Michie, 2010). There are numerous reasons why these techniques have attracted so much attention: (1) they are steeped in established social psychological theory, have been embedded in popular and well-cited theories of social cognition applied in health contexts such as the theory of planned behaviour, and address a commonly-known limitation of these theories (i.e., the intention-behaviour ‘gap’); (2) they have intuitive appeal in their parsimony; (3) they have low response burden making their promulgation through multiple modes of delivery comparatively easy; and (4) they are low-cost. Above all, there is growing support for their effectiveness in engendering behaviour change health-related contexts as stand-alone intervention strategies or as part of more elaborate interventions involving multiple behaviour-change techniques. Implementation intention and action planning interventions have been shown to be effective in changing diverse behaviours such as physical activity (Arbour & Martin Ginis, 2009; Barg et al., 2012; Conner, Sandberg, & Norman, 2010; Gellert, Ziegelmann, Lippke, & Schwarzer, 2012; Luszczynska, 2006; Milne, Orbell, & Sheeran, 2002; Prestwich et al., 2012; Prestwich, Lawton, & Conner, 2003), healthy and unhealthy eating (Adriaanse, de Ridder, & de Wit, 2009; Adriaanse et al., 2010; Armitage, 2007; Chapman, Armitage, & Norman, 2009; Prestwich, Ayres, & Lawton, 2008; Sullivan & Rothman, 2008), smoking (Armitage, 2008; Armitage & Arden, 2008), alcohol consumption (Armitage, 2009; Hagger et al., 2012), breast self-examination (Orbell, Hodgkins, & Sheeran, 1997; Prestwich et al., 2005), rehabilitation from injury (Scholz, Sniehotta, Schuz, & Oeberst, 2007), vitamin consumption (Sheeran & Orbell, 1999), cancer screening behaviours (Browne & Chan, 2012; Rutter, Steadman, & Quine, 2006; Sheeran & Orbell, 2000), workplace health and safety (Sheeran & Silverman, 2003), vaccine uptake (Milkman, Beshears, Choi, Laibson, & Madrian, 2011; Payaprom, Bennett, Alabaster, & Tantipong, 2011), contraception use (de Vet et al., 2011; Martin, Sheeran, Slade, Wright, & Dibble, 2009; Teng & Mak, 2011), and dental health behaviours (Orbell & Verplanken, 2010; Schuz, Wiedemann, Mallach, & Scholz, 2009). In addition, systematic reviews have confirmed the effect of implementation intentions on behaviour in multiple behavioural domains (Gollwitzer & Sheeran, 2006) and in specific health-related behavioural domains such as physical activity (Bélanger-Gravel et al., 2013) and healthy eating (Adriaanse et al., 2011). However, while there is growing support for these planning interventions in the health-behaviour literature, a number of limitations in the research have been noted. For example, the meta-analytic findings indicate substantial heterogeniety in the effect. In other words, there is a lot of variation in the strength of the effects of planning interventions, implying that their effectiveness varies across studies. This heterogeneity presents considerable challenges when attempting to systematically evaluate the evidence in terms of the effectiveness of planning interventions in health behavioural contexts. Possible reasons for the heterogeniety may be variations in study design and execution. For example, studies differ in their definition and operationalisation of planning procedures and their proposed mechanisms for the effect (e.g., mediation analyses). The heterogeneity in the effect sizes and lack of consensus in the definitions and operationalisation of planning interventions in health contexts present considerable problems to researchers attempting to develop interventions to change health behaviour adopting planning techniques. The aim of this Synergy expert meeting is to stimulate discussion and debate of the evidence on planning interventions in health behaviour. The goal will be to develop a consensus on the most effective means to implement and evaluate planning interventions to move the field forward and resolve some of the theoretical, operational and methodological shortcomings of previous research. Specifically, the expert meeting discussion will focus on, but not be limited to: evaluating the research evidence on interventions adopting planning components; identifying the common features and differences of planning interventions in terms of operationalisation, design, measurement, mechanisms, and evaluation of planning components; identifying the salient gaps in the literature; formulating possible guidelines for good practice; and identifying priority areas for future research that will improve understanding of planning interventions in the field of health behaviour. We will ask researchers to bring their own experiences of intervention research (including implementation intentions and action planning techniques) to the expert meeting, particularly the scripts and methods they have used in their interventions themselves, and the source material for their interventions. The idea would be to use these as a basis for discussion of variations and consistencies in the current literature and practice of planning interventions. We would also ask participants to report on the success of their manipulations, any failed replications, and feedback and reports from participants on the use of the techniques. This would enable the identification of strengths of current descriptions of these techniques in the literature and the limitations, omissions, lack of clarity, and needs for future research. Each half day of the expert meeting will include a particular theme (outlined below) that will be introduced by the facilitators, an initial exercise where participants will work in small groups on a particular aspect of the theme, and then a collaborative session where each group feeds back to the main group on their findings. The feedback session will be followed by a general discussion of the main issues, with all participants encouraged to contribute. Ideas and points will be recorded for the group using a whiteboard. Each session will be followed by a summary session to finalise the points and ask for additions. The points from each session will be typed up and added to a set of summary notes. At the end of the expert meeting, a final summing-up session using the notes as a stimulus will aim to arrive at a consensus in terms of the definition, contents, appropriate study design (e.g., intervention components, measures, and analyses), and key issues in need of research with respect to planning interventions. Defining and conceptualising of planning interventions (e.g., distinguishing between types of planning intervention and their role in social-cognitive models), how should they be operationalised, and what are the conceptual differences between types of planning e.g. implementation intentions and action planning. Format and measurement of planning techniques (e.g., mode of delivery, measurement effects, format, use of examples, self- vs. other-defined plans). Mechanisms and processes underpinning planning technqiues (e.g., the role of habit, moderators of planning intervention effects, forming multiple plans, planning interventions for low intenders). Design issues around planning techniques and interventions based on them (e.g., sustainability of behaviour change, intervention fidelity). The way forward: what would a ‘gold’ standard design for a planning intervention study look like? Martin Hagger (Curtin University, Australia) and Aleks Luszczynska (University of Colorado, Colorado Springs) both have considerable experience with the use of implementation intentions and action planning interventions in health behaviour. In addition, they have experience in running expert meetings and roundtables on the subject of planning at two EHPS conferences (Crete, 2011 and Bordeaux, 2013). John De Wit (UNSW, Australia), who also has a wealth of expertise in both the theoretical and application of interventions, including the use of planning techniques, in a number of health behaviour contexts, has also agreed to contribute to the expert meeting as he will be in attendance and could serve as an additional facilitator in the event of a large attendance. We also plan on inviting participants who have experience intervention design and other behaviour-change techniques to offer different and complementary perspectives. An increasing number of studies in many health behavioural contexts are adopting planning interventions, and many of the EHPS members will be affiliated to labs and research groups that are currently using at least one form of planning as part of their interventions. There will also be researchers with links to policymakers and practitioners interested in how planning interventions can be most effectively employed on a practical level in the field to maximize health behavior maintenance. The topic is, therefore, a very pertinent one for many members of the society and this is an opportunity for an in-depth discussion of the issues surrounding planning interventions and their implementation that will not only benefit the participants, but will also provide consensus recommendations for non-attending members interested in using planning interventions in their research. 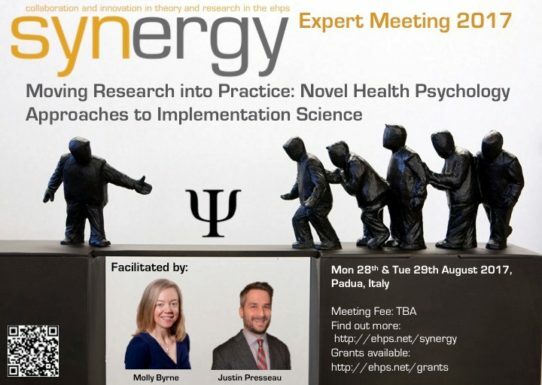 A small number of grants are available for attendants of the Synergy expert meeting against expert meeting registration, conference fee, accommodation and travel. See the grants page for further details. Over the past decade, digital interventions have become an increasingly widely used mode of delivery for health-related behaviour change interventions, including public health interventions (e.g. smoking cessation, weight management, physical activity promotion, alcohol reduction), illness management interventions (e.g. to manage asthma, pain and fatigue) and health professional resources (e.g. to manage diabetes jointly with patients). There is evidence that internet-based interventions can support people to change their behaviour (Kohl, Crutzen, & de Vries, 2013; Webb, Joseph, Yardley, & Michie, 2010). Until recently, these interventions have principally been designed for access through a PC. However, with the rapid uptake of smartphones and tablet computers (now used by 1 in 5 people worldwide) attention is shifting to the potential of mobile digital delivery of healthcare support – mhealth (Bacigalupo et al., 2013; Schueller, Muñoz, & Mohr, 2013). Mhealth interventions are potentially attractive to users as they can provide convenient, private, instant access to automated, expert and peer support to help achieve a wide variety of behavioural goals. Their value for behavioural researchers is that they have the potential to collect detailed longitudinal data about the process of behaviour change from a vastly larger sample of the population than has previously been possible, permitting unprecedented analysis of the factors influencing behaviour change. With so many potential mhealth providers, the market has already become saturated with untested and probably unhelpful applications (Azar et al., 2013; Pagoto, Schneider, Jojic, DeBiasse, & Mann, 2013). Rigorous evaluation using experimental designs is problematic because of the opportunity for participants to access other relevant applications. Mobile technology is advancing very rapidly, providing new functionality, that means that lengthy study designs with long-term follow up to establish maintenance may not be appropriate. What is the potential of mhealth for facilitating behaviour change? What new opportunities does mhealth offer for delivering interventions? What is the evidence that mhealth delivery can improve on other methods? What are the challenges to using mhealth for facilitating behaviour change? What particular problems are posed by using mhealth for delivering interventions (e.g. for reach and adherence)? Given the opportunities and challenges identified in the first session, what are the most promising directions for future mhealth interventions? What methods and resources are required to optimise mhealth intervention delivery? What new technological developments and business models are needed? What is the potential of mhealth for understanding behaviour change? What new opportunities does mhealth offer for researching behaviour change? What are the methodological challenges for evaluating mhealth interventions (e.g. dropout, difficulty of obtaining objective verification)? Given the opportunities and challenges identified in the first session, what are the most promising directions for future mhealth research? How can we optimise mhealth research, and what new design and evaluation methods are needed? The aim of this expert meeting is to work towards a publishable output reflecting expert consensus regarding opportunities, challenges and future directions for mhealth intervention and research. To ensure that all participants are able to contribute to this process we will therefore select a maximum of 20 participants with experience in research on digital interventions. The applications for this workshop have closed. Azar, K. M., Lesser, L. I., Laing, B. Y., Stephens, J., Aurora, M. S., Burke, L. E., & Palaniappan, L. P. (2013). Mobile applications for weight management: theory-based content analysis. American Journal of Preventive Medicine, 45, 583-589. Bacigalupo, R., Cudd, P., Littlewood, C., Bissell, P., Hawley, M. S., & Buckley Woods, H. (2013). Interventions employing mobile technology for overweight and obesity: an early systematic review of randomized controlled trials. Obesity Reviews, 14, 279-291. Kohl, L. F., Crutzen, R., & de Vries, N. K. (2013). Online prevention aimed at lifestyle behaviors: a systematic review of reviews. Journal of Medical Internet Research, 15, e146. Pagoto, S., Schneider, K., Jojic, M., DeBiasse, M., & Mann, D. (2013). Evidence-based strategies in weight-loss mobile apps. American Journal of Preventive Medicine, 45, 576-582. Schueller, Stephen M., Muñoz, Ricardo F., & Mohr, David C. (2013). Realizing the Potential of Behavioral Intervention Technologies. Current Directions in Psychological Science, 22, 478-483. Webb, T.L., Joseph, J., Yardley, L., & Michie, S. (2010). Using the Internet to promote health behavior change: A meta-analytic review. Journal of Medical Internet Research, 12, e4. 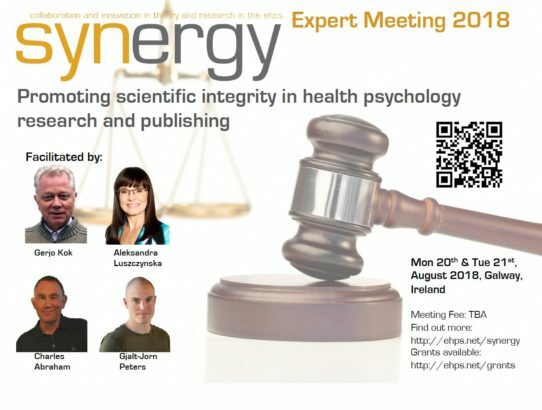 The 14th Synergy Expert Meeting (EM) takes place directly before the EHPS annual conference.It aims to advance the standard of work within health psychology by pooling expertise, sharing critical evaluations, and stimulating networking and collaborative research between researchers in an informal and supportive atmosphere. Thus, the delegates play an active role in the discussions and the sharing of expertise, and therefore should be able to contribute to the meeting. WHY SHOULD I ATTEND THIS YEAR’S EM? The 2016 Synergy EM aims to survey the state of the art of research on close relationships and health regarding theory, design, and statistical models in observational and intervention research. In compiling the relevant questions and existing evidence the EM will move the field of research on social relationships and health forward. As final outcome of the EM, facilitators and delegates will compose and co-author a consensus-based position paper. We especially welcome senior researchers with substantial experience in conducting studies in close relationships and health, to join the EM. WHERE AND HOW TO PARTICIPATE? There is one grant available for attendance at the Synergy EM. This grant is not restricted to junior researchers. Senior researchers, which are Synergy’s target population, are especially encouraged to apply as well in the case of financial need. See: http://ehps.net/grants for further details. generate solutions to these challenges. Day 1 (pm): What can Health Psychology contribute to Implementation Science? Day 2 (am): What can Implementation Science contribute to Health Psychology? Day 2 (pm): Focus on outputs; Discussion around strategies to promote longer term collaborations between meeting participants within the EHPS, and promote networks in Health Psychology Implementation Science, including discussion of possible international funding opportunities. As a scientific society, the European Health Psychology Society has influence on scientific practices, and one of the instruments we have available are our publishing policies. Such policies can be crafted to minimize questionable research practices. For example, deliberately adjusting or misrepresenting statistical analyses to mislead the audience into thinking that a study’s outcomes were different from what the data suggest is clearly wrong. Journals can take a number of steps to make such strategies hard or impossible. On the other hand, many researchers who engage in questionable research practices do so with the best of intentions. Which policies would be constructive policies for the EHPS journals to adopt? Should Full Disclosure (publishing of protocols, materials, stimuli, data, analysis scripts, and output) be enforced? Should studies that were not preregistered still be accepted? Are publishing policies the way to go at all? Which other instruments can the EHPS use to promote scientific integrity in health psychology? This Expert Meeting will be used to discuss whether the EHPS, as a society, has a role in promoting scientific integrity in health psychology, and if so, what. The product will be a proposal to the executive committee and the journal editors. CREATE organised a workshop prior to the 8th annual conference of the EHPS in Florence, Italy, on September 29-30, 1999. There were two sessions: The first session was about general research problem solving skills, under supervision of Prof. Marie Johnston of the University of St. Andrews, Scotland. The second session was a writing and publishing workshop under supervision of Prof. Charles S. Carver of the University of Miami. In this part of the course, research problems of the students most representative of problems in health psychology research were discussed, and solutions were offered. Before entering the course, participants were asked to write a short paper on their current research and the most important problems they encountered. This session was highly interactive: Students were offered an opportunity to ask questions about problems they encountered in their research. They performed problem-solving exercises in small groups. Prof. Marie Johnston is a leading researcher in European health psychology. She is former president of the EHPS, and co-editor of Psychology & Health. For more information on Prof. Johnston’s work see her website. The purpose of this session was to provide information on issues regarding publishing in English language scientific journals, and to teach participants basic skills for writing scientific papers. Prof. Carver showed which are the most important characteristics of health psychology articles that get published in good journals. He also did some writing and critical reading exercises to demonstrate the nature of the skills necessary to produce a good article. Students were asked to prepare an exercise before entering the course. Prof. Charles S. Carver is a highly acclaimed scholar and author, and is associate editor of the APA journal for Health Psychology. He teaches at the University of Miami, Florida, USA. For more information on Prof. Carver’s work see his website. Workshop slides on Professional Writing – This document was used as a handout for the CREATE Workshop on Professional Writing, supervised by Prof. Charles S. Carver. This document is available to download below and for informational purposes only. Prof. Marie Johnston from the University of St. Andrews (Scotland) and Prof. John Weinman from King’s College London (England), directed the CREATE workshop 2000. The title of this three-day workshop was “Nothing is more practical than a good theory: Exploring, testing, and applying theories in health psychology”. 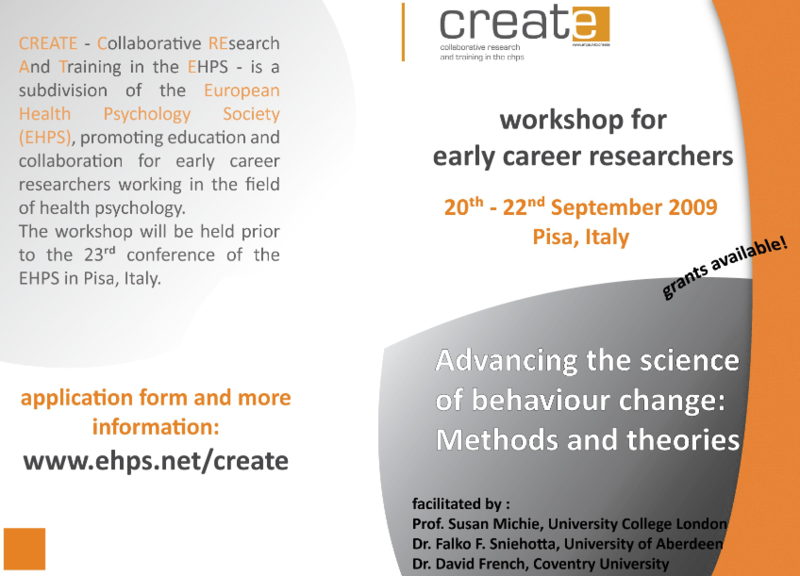 After the success of the first CREATE workshop held in Florence, Italy, in September 1999, this workshop again was an excellent learning experience for early career health psychology researchers. 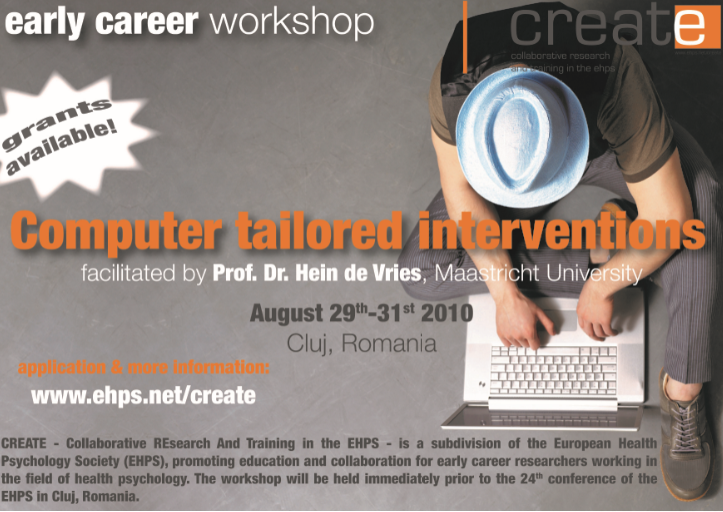 The workshop took place immediately before the EHPS conference in Leiden, The Netherlands (16 -18 August 2000). Health psychology is a practical discipline, but in this session it was argued that theoretical foundations are necessary for the progress of knowledge. Theory can inform the design of interventions and the measures that are used for evaluation. The rationale for theory building in health psychology and the argument for theory-driven research were discussed. What are the advantages of general theories (e.g. from social and personality psychology) over specific or implicit theories for ill people? Examples of health psychology research that use a general theoretical framework were discussed. What are the characteristics of useful theories for application in health psychology research? What are the rules for developing theories or extending existing theories? Recent developments and thinking about cause and effect in health psychology were discussed. What role can methodology play in the development of theories? The value of using factor analysis as a research tool (e.g., dimensionality of a construct). What is causality and how can we test for it? The pros and cons of randomised experimental designs in health psychology. What is the clinical significance of the theories we use? Can we use theories in health psychology to design successful interventions? Can we evaluate the effects of an intervention using a particular theory? What are examples of theory-based intervention programmes? Professor Brian Oldenburg (Brisbane), Dr. Paul Kennedy (Oxford) and Mr. Paul Gardner (St Andrews) had agreed to direct the CREATE workshop in 2001 in St. Andrews, Scotland. The workshop teachers had outstanding academic records and excellent teaching reputations. The workshop took place on the three days (2-4 September 2001) preceding the EHPS / DHP conference in St. Andrews (5-8 September 2001). The workshop venue was a modern-equipped teaching room in St. Andrews University. The workshop was facilitated by John Weinman, Kavita Vedhara and Rona Moss-Morris. The workshop facilitators with their outstanding academic and teaching skills provided the participants with the opportunity to explore the use of different research methods in health psychology. It will draw on different research areas including illness perceptions, psychoneuroimmunology, and interventions in chronic illness as a way of providing examples of diverse areas of research. The work was mainly done in small groups, which allowed participants to consider and apply different research methods for answering different types of research question in health psychology. This year, participants were also asked to share their work in progress with the rest of the group to stimulate the exchange of ideas and expertise within the group and foster future collaboration among the participants. The workshop took place on the three days (29 September-1 October 2002) preceding the EHPS conference in Lisbon (2-5 October 2002). The workshop venue was the holiday village Inatel in Oeiras, which is located 16 kilometres outside of Lisbon on the Atlantic coast. The workshop was facilitated by Kerry Chamberlain. Kerry is a Reader in Health Psychology at Massey University in New Zealand. He has facilitated and presented workshops about qualitative research in health psychology at international meetings, including The International Congress for Behavioural Medicine. Kerry, with his outstanding academic and teaching skills provided the participants with the opportunity to explore epistemologies and ontologies for qualitative research in health psychology as well as suitable methods. There was an equal focus on the importance of understanding theories of qualitative research and developing skills to conduct such research. The focus of this workshop was on making the participants “bilingual” in the language and culture of both qualitative and quantitative research. The presentation was interactive and participatory, involving group work and exercises. 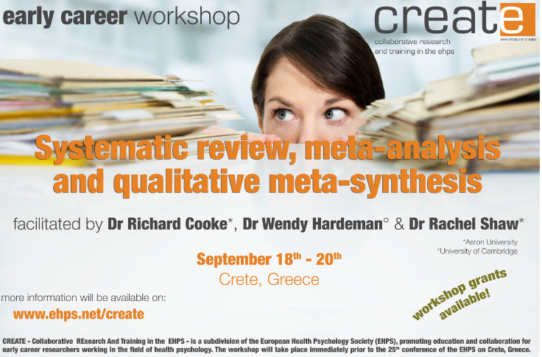 Qualitative Research in Health Psychology -This document contains a list of further readings on qualitative research in health psychology recommended by Kerry Chamberlain who was the facilitator of the CREATE workshop 2003 in Kos. If you are interested in the slides Kerry Chamberlain used for the workshop, please do not hesitate to write him an email: K.Chamberlain@massey.ac.nz. The workshop took place from 21st to 23rd of september, 2003. The workshop venue was the Kipriotis Village Hotel, Psalidi, Kos in Greece. Conner, M., & Norman, P. (1996). (eds.) Predicting health behaviour: Research and practice with social cognition models. Buckingham: Open University Press. Rutter, D., & Quine, L. (2001) (eds.) Changing health behaviour: Intervention and research with social cognition models. Buckingham: Open University Press. Hunter M.S., Grunfeld E.A., & Ramirez A.J. (2003). Help-seeking intentions for breast-cancer symptoms: A comparison of the self-regulation model and the theory of planned behaviour. British Journal of Health Psychology, 8, 319-333. Workshop slides: These slides (see below) were presented by Peter Harris at the 2004 CREATE workshop in Helsinki and contain loads of useful information for disseminating and publishing your findings. Facilitated by Charles Abraham, Susan Ayers and Susan Michie. Theory may initially emerge out of descriptions of observed associations and develop as explanations of how and why certain events are associated. Such explanations can be tested using predictive studies but are most effectively tested using experiments in which particular independent variables are manipulated and theory-specified effects on dependent measures are observed (Abraham, 2004). Unfortunately theory-based interventions in health psychology often fail to fulfill this purpose. Links between explanatory theories and the change techniques in interventions may be only loosely related, confounding variables may not be controlled and it may be unclear which theory-based techniques were responsible for the observed behaviour or health change (Michie & Abraham; Rothman 2004). This dislocation of theory and experimental theory selection impedes theory development and makes it more difficult for health psychologists to develop evidence-based interventions. For example, the rapid development of interventions designed to promote HIV-preventive behaviour resulted in few theoretically-based programmes and few, if any, of these were found to influence sexual behaviour (Fisher & Fisher, 1992). By contrast, more recent HIV-preventive interventions, based on social cognition models, have proved to be effective in controlled trials (Fisher et al., 1986; Jemmott & Jemmott, 2000; Kalichman, Carey & Johnson, 1996; Kalichman & Hospers, 1997). Thus social cognition models appear to offer a theoretical basis for health promotion activities. Unfortunately, however, there are relatively few experimental tests of the effectiveness of interventions based directly on these theories (e.g., Jones, Jones, & Katz, 1988). For example, Hardeman et al. (2002) identified only 12 studies that used the TPB to develop a behaviour change intervention. Of these, four were found to change behaviour but none investigated whether behaviour change was mediated by the psychological changes proposed by the theory. The workshop will provide an opportunity to reflect on the relationship between intervention design and theory in health psychology. We will discuss how interventions can be designed and tested in a manner that furthers theory development and selection. We will also consider challenges that arise in designing and implementing interventions as well as factors that are crucial to effective intervention evaluation. In this context we will consider the utility of the intervention mapping framework in intervention design (Bartholomew, Parcel, Kok, & Gottlieb, 2001). This includes theory selection. Michie et al. (2004) map out a series of theoretical domains from which intervention designers may select relevant theories. How useful are these to intervention design. Kelley, K. & Abraham, C. (2004). RCT of a theory-based intervention promoting healthy eating and physical activity amongst out-patients over 65. Social Science and Medicine, 59, 787-797. Kok, H., Schaalma, H., Ruiter, R. A. C., & van Empelen, P. (2004) .Intervention mapping: A protocol for applying health psychology theory to prevention programmes. Journal of Health Psychology, 9, 85-98. Michie, S. & Abraham, C. (2004). Interventions to change health behaviours: Evidence-based or evidence inspired? Psychology and Health, 19, 29-49. Michie, S., Johnston, M., Abraham, C., Lawton, R., Parker, D., Walker, A. (2004). Making psychological theory useful for implementing evidence based practice: a consensus approach. Quality and Safety in Health Care, 14, 26-33. Rothman, A. J. (2004). Is there nothing more practical than a good theory? Why innovations and advances in health behavior change will arise if interventions are used to test and refine theory. International Journal of Behavioral Nutrition and Physical Activity 2004, 1, 11. The workshop took place from 28th – 30th of August, 2005, i.e. 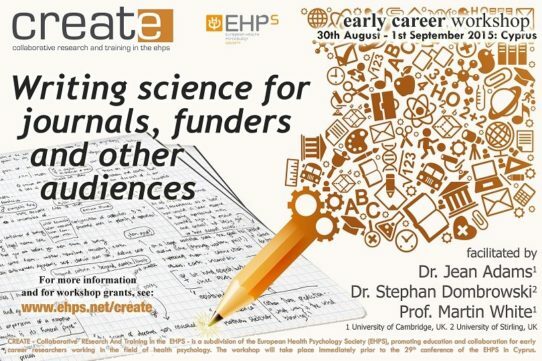 on the three days preceding the EHPS conference. The workshop venue was the University of Galway in Galway, Ireland. Moderation and Mediation: These slides were presented by Ralf Schwarzer at the 2006 CREATE workshop. You can also download an SPSS macro to compute Sobel’s z via Bootstrapping as recommended by Preacher, Rucker & Hayes (2004) (see below). De Lange, A. H., Taris, T. W., Kompier, M. A. J., Houtman, I. L. D., & Bongers, P. M. (2003). “The very best of the Millennium”: Longitudinal research and the Demand-Control-(Support) Model. Journal of Occupational Health Psychology, 8, 282-305. Norris, F.H., Friedman, M, Watson, P., Byrne, C., Diaz, E, Kaniasty, K (2002). 60,000 disaster victims speak: Part I. An empirical review of the empirical literature, 1981 – 2001. Psychiatry, 65, 207-239. Luszczynska, A., Mohamed, N. E., & Schwarzer, R. (2005). Self-efficacy and social support predict benefit finding 12 months after cancer surgery: The mediating role of coping. Psychology, Health and Medicine, 10, 365-375. Benight, C., & Bandura, A. (2004). Social cognitive theory of posttraumatic recovery: The role of perceived self-efficacy. Behaviour Research and Therapy, 42, 1129-1148. Kaniasty, K. (2005). Social support and traumatic stress. PTSD Research Quarterly, 16 (2). The National Center for PTSD. DiMatteo, M. R. (2004). Social Support and Patient Adherence to Medical Treatment: A Meta-Analysis. Health Psychology, 23, 207-218. Kaniasty, K., Norris, F.H. (2004). Social support in the aftermath of disasters, catastrophes, and acts of terrorism: Altruistic, overwhelmed, uncertain, antagonistic, and patriotic communities. In R. Ursano, A. Norwood, & C. Fullerton (Eds. ), Bioterrorism: Psychological and public health interventions, (pp. 200-229). Cambridge: Cambridge University Press. Davidson, K. D., Goldstein, M., Kaplan, R. M., Kaufmann, P. G., Knatterud, G. L., Orleans, C. T., Spring, B., Trudeau, K. J., & Whitlock, E. P. (2003). Evidence-based behavioral medicine: What is it and how do we achieve it? Annals of Behavioral Medicine, 26, 161-171. Luszczynska, A., Sobczyk, A. & Abraham, C. (in press). Planning to reduce weight: Implementation intentions intervention helps to reduce body weight among overweight or obese women by prompting action planning. Health Psychology. CREATE is saddened to learn of the loss of Professor Herman Schaalma on 25 July, 2009. Our thoughts and condolences are with his family and friends at this difficult time. Intervention Mapping: Designing Theory-based and Evidence-based Interventions: This workshop focused on the introduction of Intervention Mapping, a protocol for the development of theory- and evidence-based health education & promotion programs. The emphasis was on applying the Intervention Mapping processes to the development of prevention programs. Participants were guided through a series of steps that taught them theory- and evidence-based program development. Contents: Orientation to, and application of Intervention Mapping; orientation to prevention; approaches to using theory; prevention program case examples; review of theories used in health promotion. At first glance, perceiving a health threat seems to be the most obvious prerequisite for the motivation to change risk behaviors. If one is not aware of the risky nature of one’s actions, motivation cannot emerge. Therefore, a crucial barrier for health communication is to increase the personal relevance of a health issue to focus people’s attention on information that pertains directly to their personal risk. However, numerous empirical studies demonstrated that people tend to underestimate their risk and that they are reluctant to accept unfavorable risk feedback. How do people judge health risks? What are the psychological and behavioural consequences of risk communication? See below for the 10th CREATE anniversary brochure! Facilitated by: Susan Michie, Falko Sniehotta and David French. Learning took place through a combination of prior reading, short taught components, small group work, participant presentations and practical exercises. The workshop included a strong focus on relating more abstract issues to the participant’s own research. www.mrc.ac.uk/complexinterventionsguidance. The workshop therefore covered issues relevant to interventions to change health-related behaviours: (a) development; (b) feasibility/ pilot testing; (c) evaluation; (d) implementation into routine practice. We discussed the following: good scientific practice in developing and testing health behavior interventions, using theory to guide intervention development, using interventions to develop theory, the importance of construct validity of interventions, assessing and maximizing fidelity of treatment to protocol, assessing what works, methods for reviewing evidence and testing theory, and how the field of behavior change interventions can be advanced. Participants were encouraged to relate these issues to their own research (whether planned or underway), to maximize engagement, interaction and learning. Facilitated by: Hein de Vries, Matthijs Eggers and Daniela Schulz (Maastricht University). The goal of this workshop was to learn and to apply basic principles of computer tailoring. As the theoretical framework we used an integration of social cognitive models – such as social learning theory, theory of planned behavior, health belief model – referred to as the Integrated Model of Behavior Change, or the I-Change Model. We employed a special software package, the Tailored Health Builder. We worked in small groups of 4-5 people and developed brief computer tailored interventions. to pilot and evaluate the computer tailored intervention. Facilitated by: Dr. Richard Cooke, Dr. Wendy Hardeman and Dr. Rachel Shaw. To understand the steps involved in conducting a systematic review and writing up for publication. To understand the steps involved in running meta-analysis and writing up results for publication. To understand the steps and principles involved in conducting a meta-synthesis of qualitative evidence. The workshop was a mixture of lectures, group work and presentations from participants. Participants were encouraged to bring examples from their own research to the workshop. Facilitated by: Prof. Kerry Chamberlain (Massey University, NZ). Slides from the workshop can be found below. Kerry Chamberlain is a critical health psychologist who has used and written about qualitative research in health psychology for a number of years. His research focuses on health and the everyday, with specific interests in medications, media, materiality, mundane ailments, food, and disadvantage, and in qualitative research methodology. The objective of this workshop was to provide health psychology researchers with information, directions and some practice in undertaking qualitative research on health topics. The workshop was aimed at researchers who are new to qualitative research or who have only limited experience in conducting qualitative research. Researchers with more experience in qualitative research also benefitted from the perspectives on such research offered during the workshop. The workshop was designed to build understanding, skill and confidence in undertaking qualitative research in health psychology. We take a critical approach to such work, and the workshop emphasised the themes of criticality, creativity and reflexivity throughout. We should also note that there is no ‘right way’ to do qualitative research – this workshop looked at one perspective on how to conduct worthwhile interpretative research that strives to be excellent. The workshop was divided into five half-day sessions, plus a sixth shorter closing session, each with its own theme to be addressed and discussed (although these also interpenetrate). Each session had one exemplar reading that participants were expected to have read before the session. Being Qualitative: epistemology; epistemophobia; social constructionism; objectivism; assumptions; theoretical frameworks; establishing research aims; using theory – theorising; keeping research aligned; bias; what are we aiming for? Methods and methodologies: methodological frameworks; why you don’t need a methodology; whose methodology is it anyway? ; being innovative; data gathering; participants and sampling. Doing analysis: description and the garden path analysis, interpretation; why you would (almost) never do thematic analysis; responsibilities of the researcher; whose voice is it anyway? ; the three stages of analysis; getting in and getting out; being reflexive; depth and scope; keeping aims in view; what’s the product? Representation: what/whose story to tell? ; keeping the aims in view, but can they change? ; writing it up – voice, claims, interpretation, discussion, structure; what are quotes for? ; who is the audience? ; publication pressures and creativity; reflexivity in action. Pushing the boundaries: methodological creativity and innovation; interpretative creativity and innovation; representational creativity and innovation; taking chances, making a splash. Being Qualitative – Reprise: where are we now. Chamberlain, K., & Murray, M. (2008). Qualitative research in health psychology. In C. Willig & W. Stainton Rogers (Eds. ), Handbook of qualitative methods in psychology (pp. 390-406). London: Sage. This reading is intended to provide an overview of qualitative research in health psychology, and provide a overview background reading for the whole workshop. In recent decades, researchers have become increasingly interested in understanding people’s thoughts, emotions, and behaviors in their natural contexts. The commonality in methods for doing so—experience sampling, daily diary, and ecological momentary assessment methods—is that they all involve intensive longitudinal assessments. These intensive longitudinal methods allow researchers to examine processes in daily life in a way that is not possible using traditional methods. Researchers can obtain repeated observations over the course of hours, days, and weeks. Intensive longitudinal data, however, present several data analytic challenges stemming from the various possible sources of interdependence in these data. The multilevel or hierarchical linear model provides a flexible set of analytic tools that can take account of these complexities. An introduction to mediation in intensive longitudinal data. The course will include lectures, software demonstrations, and computer lab work. Various software packages will be used, including SPSS, SAS, and Mplus. 12:30 pm to 2:00 pm Lunch. Recommended reading: Book chapters 1 to 5 and 9 of Bolger and Laurenceau (2013). 24-26th August, 2014, Innsbruck, Austria. Presentation files from the workshop are available below. Commercial apps and the evidence: Guide for Providers In this section, we aim to provide practical guidance to healthcare providers on evaluating and selecting health behavior apps that are already publically available. We will discuss a practical method to search for and select apps for clinical use, elaborate on practical recommendations for examining app content, function, and interaction, and provide an illustrative, step-by-step example using a case study of a patient seeking dietary assistance. Designing studies that develop and test novel apps: We will discuss the process of development and usability testing, feasibility, and development of mobile apps for behavior change using two of our app research projects as examples. Usability Testing: To learn the process of usability testing, participants will conduct usability testing on pre-selected apps that vary in usability. We will review the steps of requirements gathering through paper prototypes, co-design sessions, iterative testing, “think aloud” protocols, and the Systems Usability Scale. What is social media? We will explore the various forms of social media, usage worldwide, demographics of users, and the presence of healthcare, science, and medicine in social media. Academics more than ever need to make the public and key stakeholders aware of their work. This seminar is for faculty, students, administrators, and academic staff and covers how engagement in social media can benefit the academic career and increase one’s impact. Using social media professionally will also make the user aware of the ways it is being used by patients, healthcare systems, and healthcare professionals which is necessary to stimulate research ideas. Successful examples will be discussed as well as the time and effort necessary to build social media capital using various modalities. Participants do not need a background in social media to participate. The use of online social networks has become ubiquitous in recent years, which means we have new ways to interact socially and to disseminate information. The possibilities for health research are limitless. Patients are increasingly flocking to online social networks to learn more about their health conditions and interact with providers and other patients. The phenomenon has been coined “peer-to-peer healthcare” by the Pew Research Center Internet and American Life Project, the group tracking the growth of this trend. This seminar is for faculty and students interested in leveraging online social networks for health research. Participants will learn of the different ways social media has been leveraged to measure, understand and intervene upon disease and health behavior. Some familiarity with social media (e.g., Facebook, Twitter) is strongly suggested (but not mandatory) for participation in this seminar. How to Get Started on Social Media Participants will learn how to develop a social media presence on Facebook, Twitter, Youtube, Linked In, and blogs. Participants will identify their social media goals and be given recommendations regarding the social media outlet that best matches their goals. During the workshop, participants will open a Twitter account, learn to use its features, find relevant information, develop a base of followers, and produce content. Participants will also learn where they can submit guest blog posts for maximal visibility and tips for writing blog posts. Time management strategies will be discussed. Participants should be equipped with computers and wifi for this hands-on workshop. No previous experience with social media is necessary for this workshop. Methodological Issues in Social Media Research We will discuss how the various forms of social media can be used in recruitment, retention, intervention delivery, and observational research. Ethical issues will be reviewed as well as the challenges to conducting this research. 30th August – 1st September, 2015, Cyprus. To develop skills in, and provide opportunities for, facilitated peer-review and feedback. The form of the workshop will be interactive and collaborative throughout. Learning will be facilitated primarily through participants writing, reflecting on their own writing, taking part in facilitated peer review of each other’s writing, and sharing their previous and developing experiences. We will adopt an interactive and collaborative approach throughout. Formal presentations from facilitators will be kept to a minimum (around 20 minutes each). Learning will be facilitated primarily through participants writing, reflecting on their own writing, taking part in facilitated peer review of each other’s writing, and sharing their previous and developing experiences. Participants will work in small (max 5) groups. As far as possible, group members will not know or have worked with each other previously and groups will be organised to allow those working on papers and those working on grant applications to work together. Participants will bring an idea for a paper or grant application that they have given some preliminary thought to, but not yet written; a very brief outline will be requested as part of the application process for attending the workshop. Throughout the workshop participants will focus on developing their own paper or application. 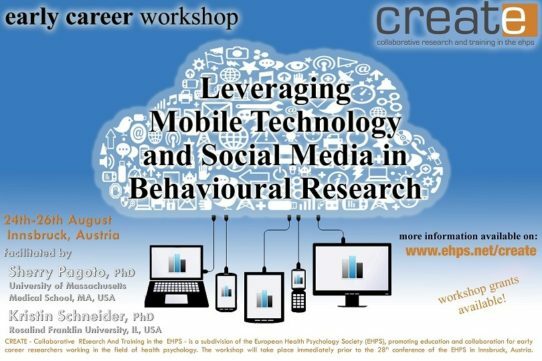 The 18th Create workshop will be facilitated by Dr. Irina Todorova and Dr. Rachel Shaw. 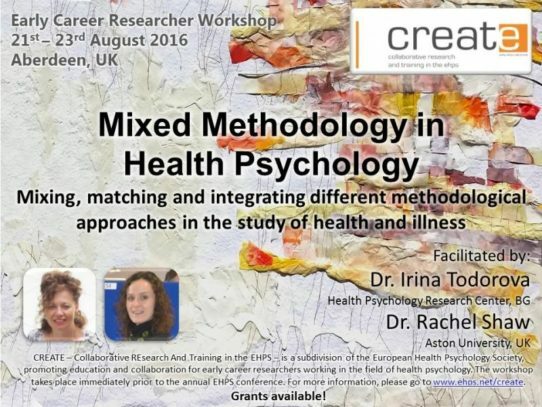 There has been increased interest in the use of mixed research methods in health psychology. The workshop will begin with a discussion of what is understood by “mixed methods research”, what are the advantages as well as the challenges and dilemmas in such an approach to research. The different types of methods are usually associated with different philosophical underpinnings, sometimes considered incompatible. Thus, we will review the ways in which psychologists have attempted to move forward with combining qualitative and quantitative methods while making sense of the paradigmatic differences – such as through post-positivist, constructivist, pragmatist and transformative paradigms. We will explore diverse models for organizing mixed methods research and combining the components, based on the purposes of the project and its research questions. Regarding the weight or priority given to the components, we will give examples of qualitatively driven or quantitatively driven studies. Regarding the timing – we will explore studies in which the qualitative and quantitative parts are concurrent, or sequentially organized. While the integration of insights from the qualitative and quantitative components is key to mixed-methods research, during the design, questions arise regarding how to achieve this integration, as well as at which stage of the research to do so – at the time of data collection, or during the analysis, or in the interpretation/discussion of the results. At each step we will process examples from our own as well as published research. This is likely to include: (1) a feasibility study aiming to test a medication review for people with dementia alongside a training intervention for care home staff caring for people with dementia in the UK; this involved qualitative elicitation research to develop the intervention, standardized outcome measures at baseline and follow-up, and a qualitative evaluation; and (2) a study of multidimensional barriers to cervical cancer prevention in Bulgaria and Romania, which included in-depth interviews with women and health providers, as well as nationally representative surveys. We will conduct multiple exercises using these examples and where appropriate will incorporate plans for your own mixed methods studies. At the end of the workshop, participants will be familiar with the benefits and challenges of combining qualitative and quantitative methods, the ways in which they can be combined and integrated, will have tried some approaches through hands-on exercises and will have a better sense of which are the positions and techniques with which they most resonate. The 19th Create workshop will be facilitated by Gerjo Kok, Rob Ruiter and Rik Crutzen. The workshop will focus on developing theory- and evidence-based interventions applied to health promotion and disease prevention. The emphasis of this workshop will be on applying the Intervention Mapping process. Intervention Mapping is a protocol for the design of health education & promotion programmes, guiding health promoters through a series of steps that will assist them in developing theory- and evidence-based programmes. Objectives: Workshop participants will apply Intervention Mapping to selected public health problems. As a result, participants will be able to design their own effective theory- and evidence-based prevention intervention health problems in their personal work contexts. Participants may ask for consultations on their own projects. Workshop format: Plenary sessions will cover the principles and processes of Intervention Mapping and include examples of health promotion programmes that have successfully applied the Intervention Mapping process. Small groups will discuss and apply the process to the selected health promotion topics. 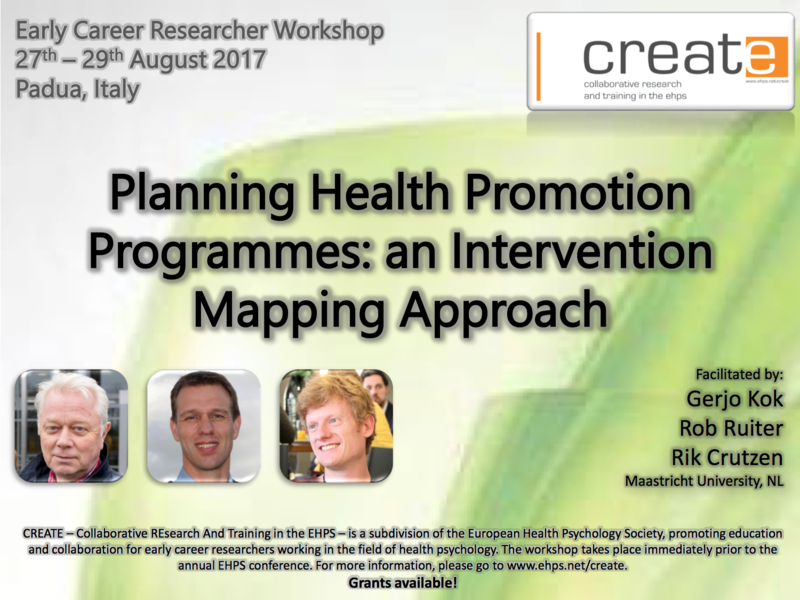 Join Create to learn all about planning health promotion programms with the Intervention Mapping approach! 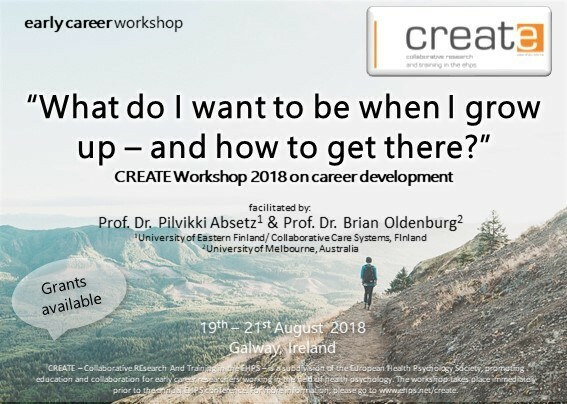 In this two-day workshop facilitated by Pilvikki Absetz and Brian Oldenburg, you will have a chance to take a detailed look at your career, both as it has developed in the past and as you would like to see it progress in the future. What are your career goals? What milestones have you already reached and what do you see coming next? What are your most important skills and capabilities? How to ensure that you are using them to their full potential and how to develop new skills and capabilities to achieve your career goals? How to “package” or brand the skills in a way that makes them useful for academia, private sector or non-governmental organizations – whether as your employers, clients or collaborators? What kinds of networks do you need, and how to build and nurture them? How to communicate effectively within the networks and beyond? How to ensure ongoing capacity building? Do you have good life/career mentor(s)? Pilvikki Absetz is a Research Director at the Department of Public Health and Clinical Nutrition, University of Eastern Finland (UEF); an Adjunct Professor of Health Promotion at the Faculty of Social Sciences, University of Tampere; and the CEO and sole owner of Collaborative Care Systems Finland (CCSF), a small enterprise providing services related to health promotion and disease prevention. She is a health psychologist specialized in dissemination and implementation of behavioral interventions to promote health and to prevent noncommunicable diseases, especially cardio-metabolic diseases. She has worked extensively to develop strength-based approaches to lifestyle change and coaching of individuals and groups. She collaborates with private, public, and non-governmental organisations in designing, implementing and evaluating health promotion and disease prevention programs, and through the CCSF, she is an SME partner in international research projects. She has ongoing collaboration in many EU-countries, Australia, India, South Africa and Uganda. She is an experienced workshop facilitator, lecturer and trainer of professionals, as well as PhD supervisor. Brian Oldenburg is Professor of Noncommunicable Disease Control in the School of Population and Global Health, University of Melbourne, Australia and Director of the Global WHO Collaborating Centre of Implementation Research for Prevention & Control of NCDs. He is a health psychologist and public health researcher who researches health policy, global health and the prevention and control of diabetes, heart disease and co-morbid mental health conditions. He has undertaken many ‘real world’ intervention trials, their evaluation and scale-up in health-care settings, work organisations, schools and other community settings in Australia and other countries, including Finland, China, Malaysia, India, Sri Lanka and South Africa. He has also developed and researched new technologies and m-Health interventions to improve health. He has produced more than 350 publications. He has been a recent Honorary Professor at research organisations and universities in Finland, Hong Kong, India and China. He has also led capacity building and training initiatives in low and middle income countries on behalf of US National Institutes of Health, the Global Alliance for Chronic Diseases and the World Health Organisation. I am a Professor in Clinical Health Psychology at the Department of Psychology, University of Crete, Greece. For more than a decade, I served as the Head of the Counselling Center for Students at the University of Crete. In addition, I served as Head of the Department of Psychology, University of Crete for two years. I currently collaborate with the University of Crete Medical School, and the Faculty of Nursing and the Dental School at the University of Athens, and I am actively involved in the activities of local associations for the support of patients suffering from cancer. I have been a member of the European Health Psychology Society since 2002 and I was the Greek National Delegate for several years (2004 – 2010). Also, I have helped in the organization of seven EHPS conferences as a Scientific Program Track Chair or as a member of the Scientific Committee, and I was the Chair of the Organizing Committee and President of the 25th EHPS Conference in Crete. For the last two years, I served as a co-opted member of the EHPS Executive Committee (National Delegate Officer). This year, I was elected an Honorary Fellow of the Society. My research interests include patient adaptation to chronic illness, the role of stress and related factors in health and illness, individual differences in health, self-regulation and dyadic regulation. Currently, I am a member of the editorial board in seven international journals and an Assoc. Editor of Translational Behavior Medicine. As President-Elect, I plan to focus on the strengthening of the international impact of the EHPS, as well as on the enhancement of the collaboration with local national health psychology societies/organizations. I am a Senior Lecturer in Health Psychology in the Faculty of Medical Sciences, Newcastle University, UK. An EHPS member since 1997, I attended 17 EHPS conferences, served on two previous ECs, was as a member of CREATE and Synergy organizing committees for 5 years and was an editor of the EHP. My research focuses on the development and evaluation of complex interventions for the promotion of health behaviours, prevention and self-management of chronic conditions. I am passionate about translating theory and empirical evidence into practice and by doing so, refining theory. support the work of our UN subcommittee in order to understand how to influence policy and support the UN in the complex implementation process of its SDG’s for the health of the population and the planet. I am very fortunate to have such a great team in this EC and also an active membership with outstanding expertise and engagement across Europe. I aim to draw on the expertise of our members and fellows to make sure that we progress towards these goals: together we are strong and can promote change. There is one final thing that we would like to embark on: mapping the history thus far of the EHPS and adding to this the potential impact of this Society.